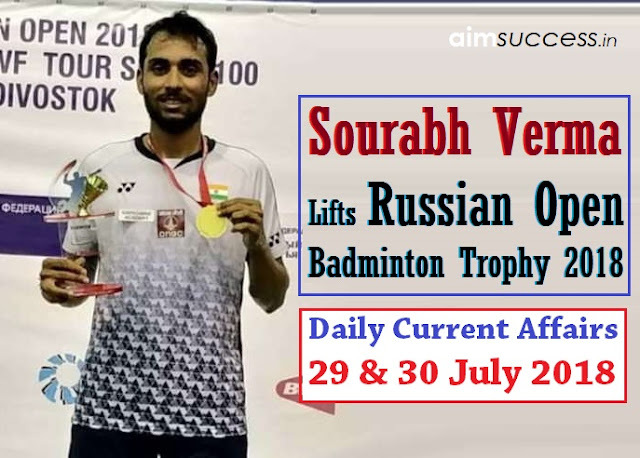 In the title clash, Sourabh beat Japan's Koki Watanabe, 18-21, 21-12, 21-17, and win his first title of the season. Indian mixed doubles pair Rohan Kapoor and Kuhoo Garg, suffered a 19-21, 17-21 loss to Russia's Vladimir Ivanov and Min Kyung Kim of Korea to settle for runners-up. In Men's Singles, Kidambi Srikanth, HS Prannoy and Sameer Verma will open their campaigns today. Note: The BWF World Championships (also known as the World Badminton Championships) is a badminton tournament sanctioned by Badminton World Federation (BWF). Egypt defeated England (2-0) to win the boy's title at the WSF-World Junior Squash team championship in Chennai. In the women's competition, Pinki was the lone gold medallist in the 55kg category. Note: India Post joined hands in promoting tiger conservation by releasing a special cover to mark Global Tiger Day at Bandipur. The two-day Annual Conference of Unified Commanders’ Conference (UCC)- 2018 has begun in New Delhi to review external security challenges as well as the country's preparedness. The marketers of the popular Amul brand of milk and dairy products “GCMMF” has been awarded the 'Marketer of the Year' award by the International Advertising Association of India.